Beeswax is an all-natural product made by honey bees. When beekeepers harvest excess honey from the hives, some beeswax is left over. And we can do so many wonderful things with it! 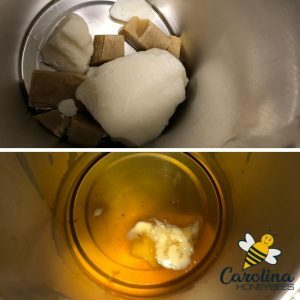 You can make your own beeswax balm to use for many purposes – including my favorite – cracked heels. Beeswax has been used in various lotions, potions, salves, balms and more for hundreds of years. From lip balm to furniture polish, beeswax brings some wonderful qualities to our homemade products. How do You Make Heel Balm? Do you suffer from rough cracked heels? I do, especially during the Winter. The use of a cream or balm with moisturizing properties can help. And , you can make your own beeswax balm for your feet. In order to create your beeswax masterpiece, you need to combine just a few ingredients. 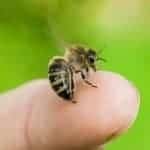 If you have ever held a bar of beeswax, you will know that it is a solid that can not be rubbed on your skin. A good beeswax balm for skin is created by mixing solid ingredients like beeswax with softer oils such as coconut oil, shea butter etc. The resulting combination is a product that is harder than lotion – yet pliable enough to spread. You will also need a double boiler (stove top) or glass container (microwave safe) for melting the ingredients. I prefer to not use the microwave so my instructions will involve melting beeswax and other ingredients on the stove top. I use a pot, a simple double boiler insert and a wax pouring pot. If you want to use a microwave, that is okay. Go slow, using very short times to safely melt your ingredients – and constant supervision. Step 1: If you do not have a standard “double boiler”, place the double boiler insert in a pot with heating water. The melting container or “wax pot” sits on the insert- surrounded by water. The hot water allows safe melting of our ingredients. Place the beeswax and shea butter in the melting container. Once the beeswax and shea butter are half melted, you can add the coconut oil. Coconut oil melts very quickly. The beeswax takes longer to melt. Cutting the beeswax into smaller chunks will speed melting. Step 2: Prepare your working surface. Working with hot wax can be messy. A large piece of aluminum foil makes clean up a breeze. You also need some type of containers to hold your finished product. If you are making beeswax balm for yourself, a wide-mouth pint jar is fine. Smaller containers are good for gift-giving. If you are using glass, pre-warm them with hot water and dry – before pouring hot wax into them. Metal tins and plastic cups are other good choices for containers. Step 3: When the ingredients have completely melted, remove from the heat source. Add Vitamin E and essential oils – if desired. Carefully, pour your ingredients into their final containers. While the pouring pot is hot, a quick wipe with a paper towel to remove any residue left inside. Step 4: Allow your beeswax balm to cool. It will return to a semi-solid state in an hour or less. Put lids on your jars (or other containers) once the mixture is set. Your product is ready to use. This recipe is a general formula. It is very forgiving, you can remelt and tweak the ingredients a bit. If you want a less solid product – remelt and add a bit more coconut oil. Apply the beeswax balm to your dry heels before bed. Cover with socks to prevent stains on clothing or falls. Using homemade recipes to making your own products is a good way to know exactly what you are putting on your body. You do not have to worry about possibly dangerous chemicals being in your balms. Creating natural beeswax products for home use is also a great lesson in sustainability. Making use of every resource produced by our hives is one way of respecting the bees. A beekeeper can make and sell beeswax balms or share the recipe with customers. 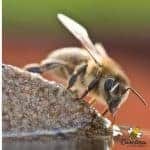 Educate others on the contributions of honey bees.